Last month I had the opportunity to interview Cornell University Professor Steve Squyres as he prepared for his role in NASA's NEEMO 15 mission (see "A Pre-Mission Conversation With NASA NEEMO Aquanaut Steve Squyres"). NASA has conducted a series of NEEMO (NASA Extreme Environment Mission Operations) missions using NOAA's Aquarius Reef Base located near Key Largo, Florida. 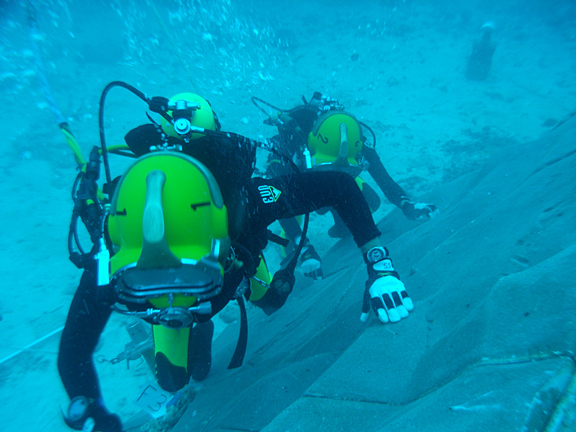 This year, the NEEMO 15 crew used the neutral buoyancy of diving as a simulator of weightless operations, a remote habitat, and a variety of submersibles and robotic devices to go through the paces of what it would be like to hover and interact with a giant rock in space. Unfortunately, a hurricane threat forced NASA to cancel their mission early - but they still managed to get quite a lot of work in. Squyres: ... yea, it is really different when you actually have to do it! Cowing: You are operating in water, so I am certain that the natural, instinctive thing to do is to flutter with your hands. Squyres: Yea, you really have to be very disciplined about that. There is this subconscious temptation to cheat all the time. I think that the temptation to cheat is probably more severe than it is when astronauts are doing EVA simulations in the Neutral Buoyancy Lab in Houston. In the NBL you are in a full-up pressurized spacesuit and it is much harder to move and harder to cheat whereas we only had wetsuits on with coveralls - so we had pretty good mobility. But I was good about not cheating - I really was. But there were times when I was using some tool or was performing some translation technique and there was some rock or tool that was just out of reach and I wanted so bad just to kick my feet. But you can't do it - you have got to play by the rules. We fully recognized that in order for what we were doing to have value hat we could not cheat by pushing against the water. Cowing: I am one of those people who, when they are underwater, are ambivalent to my orientation. Many people do not have problems being upside down no matter where they are. Others do. If you are operating close to an asteroid, you need some sort of semi-spherical movement zone where you just move yourself into the proper location with no reference to "up" or "down". Was that something that you tried to do? Squyres: What I would do was to always try to move into position regardless of what was "up" or "down" - but rather what was the best position for interacting with the particular tool, or translation mechanism, or thing on the surface that I was supposed to be working with. Most of the time we were working on the bottom - that's where all the rocks and things that we were working with were located. Because you were working on the surface of the sea bottom, you tended to face that surface. That naturally led to a kind of a horizontal body attitude - just because having your body parallel to the surface that you are working on is a good way to be oriented. One of the primary reasons why we had that rock wall down there was to have a rock surface to work on that was at a different angle that the bottom. And what we found was that when we worked on the rock wall, which was at a much steeper angle, that our bodies also tended to be parallel to that surface as well. When I was working on the rock wall I was never horizontal - I always tended to have my body parallel to the rock wall. What would have been nice would been to have put the rock wall at a 45 degree angle rather than vertical. I would have liked to have had a bigger vertical wall - but of course that would act as a big sail in the current. So there were compromises that had to be made. That said, what I found was that my body sort of naturally went into an attitude that gave me the best work position regardless of what surface I was working on. Cowing: of course you were working with a small subset of what things would actually be like inspace next to an asteorid. If you were in space and working on an asteroid your brain would be telling you how big the thing was - even if it was a very small asteroid. Your perceptions are a bit odd out there. Earth is far away so you don't pay much attention to it's size. But on the Moon, without any atmosphere to make distant things seem distant, you can have problems understanding where things are. Was there any thought given to using geodetic markers i.e. "meter sticks" or markers with numbers that would allow you to gauge distance better? Squyres: No, that was not among the tasks that we were trying to accomplish. We had a very long list of things to do and the EVA timelines were very, very full. But with regard to surface orientation, one sort of mental thing that I did while I was down there was to flip things around in my head. We were all neutrally buoyant down there. So, as I was doing things, I'd try to visualize the sea floor as a vertical surface rather than as being a horizontal surface. And it sort of worked. You could put yourself in that mindset and it really did not make any difference. Instead, you focused on the task in front of you. Cowing: Did the tools you used have any of those torque-absorbing features that the tools that NASA uses in space have - or were these just tools adapted for use underwater? Squyres: They were simply tools adapted for use underwater. There is a limit to how much fidelity you can practicably put into a situation like this. Of course, a lot of the tools that they normally use in space do not have analogs in geological field work. The tools that we tended to use were things like a rock hammer. Cowing: Ah, that is where I was heading: there you are at an asteroid - and you weigh something like an ounce - and you have a rock hammer. You just want to knock some thing off of the asteroid. And when you do, F=MA and you are moving out after you hit the rock. Squyres: Exactly. Rock hammering was one of the most interesting things we did. First of all, if you succeed in breaking off a chip you do not want the chip to go flying away. So, the technique that we used for rock hammering involved using a transparent bag that would surround the rock with some metal stakes that allowed you to transmit the force of the hammer blow to the rock itself and to prevent the rock chips from floating away. But you are exactly right though: worksite stabilization is critical for our rock hammering task. We had a number of different translation stabilization techniques that we used. One of these techniques involved using back-mounted thrusters as an analog for the sort of mobility system you might have in space where the crew member would be free flying over the surface of an asteroid. Those backpacks were great for translation. But when you got to a rock and all you had was that on your back for worksite stabilization it provided no stabilization whatsoever. If you hit a rock with a hammer you'd just shoot off in the opposite direction. So, you'd have to grapple with the rock with one hand and it was incredibly difficult to perform that task with just that back pack. But we had other techniques: we had translation lines, booms, and foot restraints. The boom and the foot restraints were very, very good for stabilization. When you used these systems and you were in a position hear rock that you wanted to sample, the task was very easy. What this brought home to me is that there is no one tool that really solves the whole problem. There are different parts to this problem. One issue is getting around and a back-mounted thruster pack. Another is worksite stabilization - particularly for tasks such as sampling rocks - and for this you need something that provides you with a solid platform to hold on to, to wrap your legs around, to tether yourself to. I thought that the foot restraint was great. Cowing: Let me get back to F=MA. You are anchored to a big boom - which on Earth is connected to something that is big and heavy. But when you are flying tandem to an asteroid and you are transmitting forces from your body's movements to the boom or restraint - and then onto a spacecraft - something has to be firing thrusters to counter those forces. Squyres: Yes. Exactly. So there are two different ways that you could make this work. One is to develop a safe, effective, and low overhead mechanism for anchoring to the surface of an asteroid. If you can do this then you have a whole suite of potential techniques at your disposal that can provide you with the kind of worksite stabilization that you will need. If, on the other hand, you cannot anchor yourself, then you will need to be mounted on some sort of foot restraint that is connected to a spacecraft - and that spacecraft is going to have to have a very capable attitude control system to be able to put you into position to do your job and to hold you in position while the reacting forces from doing things like hitting rocks with hammers with all the ramifications for fuel and movement that you can imagine. That is what this is all about: finding what works and what doesn't and then using that knowledge to come up with a set of requirements that will allow engineers to go off and use to come up with conceptual systems. Squyres: ... yea we talked about such a thing - we called it "space suction cups". Shannon liked to use the analogy of "Spiderman". It would be nice if such a thing existed. 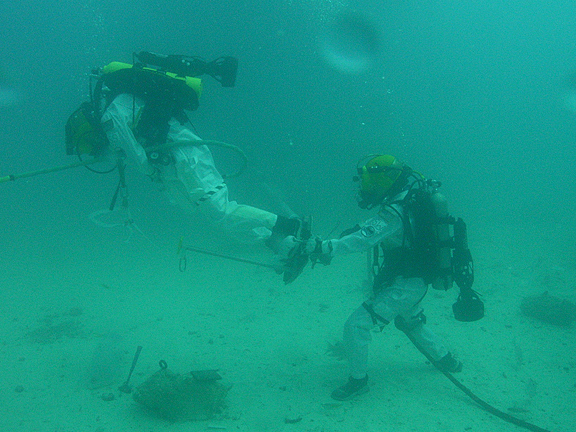 What we were not trying to simulate on this mission was anchoring technique. The obvious reason for that is that the sea floor is not a good analog for the surface of an asteroid. Indeed, asteroids have their own characteristics that we don't exactly know a lot about. If you could come up with some kind of anchoring technology that you could use quickly and reliably, that would be great. As the mission plan was put together we were very careful to include techniques that both relied upon and did not rely upon anchoring. So we tried to look at a suit of things that, regardless of the anchoring question, that you'd have a pathway to follow - one way or the other. Cowing: What comes to mind is a recent description of the asteroid Itokawa which was visited by Japan's Hayabusa mission. This asteroid is in essence, a big rubble pile no more than a 1,000 feet across. You could probably shove your hand inside of it due to the fact that it is a bunch of rocks loosely held together by gravity with a lot of empty space in between them. As such, this anchoring approach would probably be pointless with an asteroid like this - unless you were at a nickel-iron asteroid - but then you are not going to be knocking pieces off of with a simple rock hammer. Squyres; Yes, the anchoring problem does indeed need to be resolved. But the folks who set up NEEMO were very smart about it because they did not make any assumptions a priori about whether anchoring was possible. In other words if it does work, we'll use this suite of techniques - if it does not work then we'll use this other suite of techniques - and we tried out both. Cowing: it is relatively easy to throw a bunch of stuff in the water and work with it here on Earth. But this on a planetary surface - not out in the microgravity and vacuum conditions of space. Yet you have this huge structure in orbit - the International Space Station. The ISS, to some extent, an empty metal can, but it is a large structure - in space - that may approximate something like a small NEO that you might want to visit and also the spacecraft you might use to get there. Has anyone given thought to just hanging stuff off the side of the ISS and trying some of the stuff we have discussed up there? Squyres: We were not part of any discussions as to whether to terminate the mission. My understanding is that these discussions were very brief and to the point. Its like a rocket launch. You have a firmly established set of criteria laid down ahead of time. if those criteria are exceeded you pull the crew - and that's all there is to it. If you want to discuss what those criteria should be that is a fine discussion to have before the next mission. Cowing: Do you expect to be invited back - and would you go? Squyres: I would love to continue to be part of NEEMO - in any capacity. I'd be happy to go back as a support diver. I think what they are doing is so cool and I was proud t be part of it. Cowing: You have a famous story you have probably told a million times - i.e. that you can put a rover on Mars and it does amazing things but that you and your geology pals could do the same amount of work in an afternoon. Squyres; Yea, my rough equivalence factor was that one Martian Sol for a rover to do something equals 30 seconds for a person to do it on Earth. Cowing: OK, having just done the NEEMO thing, would you say that there is an applicability from that assessment with regard to asteroid missions? Would humans be better? Robots? Both? Don't know? Squyres: I think that humans are gong to be better than robots in just about any kind of setting where you are trying to do field geology. I have always made the point that the more complex the setting, the harder it is to work in, and the more complicated the geologic problems are, the more that the capability of humans will exceed the capability of robots. Having has this experience with NEEMO and having though about how you would do asteroid science (I worked on the NEAR mission), I feel very strongly that humans will be able to do a much better job on science than any foreseeable robotic system. Obviously sending humans to an asteroid to do science is not the only reason to do so - but that will be a substantial benefit for doing so. \r\n\r\nDeepWorker submersibles and the Aquarius underwater habitat will be used as analogs for the Multi-Mission Space Exploration Vehicle and Deep Space Habitat. Image credit: NASA More photos from NEEMO 15\r\n\r\nLast month I had the opportunity to interview Cornell University Professor Steve Squyres as he prepared for his role in NASA's NEEMO 15 mission (see \"A Pre-Mission Conversation With NASA NEEMO Aquanaut Steve Squyres\"). 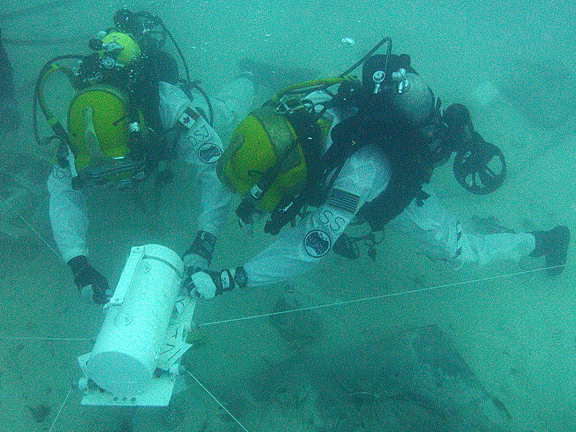 NASA has conducted a series of NEEMO (NASA Extreme Environment Mission Operations) missions using NOAA's Aquarius Reef Base located near Key Largo, Florida.